Cranberry juice contains a number of nutrients such as vitamins C, E and K that your body needs. Along with being a rich source of antioxidants, cranberry juice contains calcium, phosphorus and potassium, and it is low in cholesterol and saturated fat. 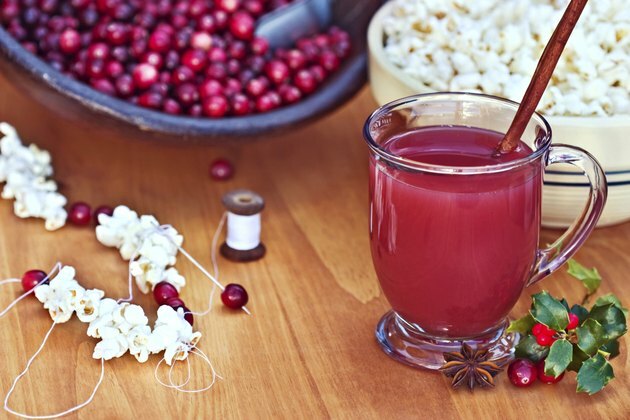 Although red and white cranberry juice offer similar health benefits, white cranberry juice is made from berries that are picked a few weeks earlier. Red cranberries are not ready for harvesting until late September into October in North America. Nutrition and weight management expert Dr. David Katz points out that although white cranberry juice is less tart, it offers many of the same health benefits as drinking red cranberry juice. One difference is that white cranberry juice does not have as much anthocyanin -– a flavonoid that gives cranberries their red color. Anthocyanin is a plant pigment that also acts as a powerful antioxidant. Cranberries contain antioxidants -– nutrients in foods that can slow oxidative damage to the body's cells and tissues. The phytochemicals in cranberries are a common type of antioxidant. These same healthful flavonoids are also found in tea, purple grapes, red wine, pomegranate and soy. Gloria Tsang, a registered dietitian, explains that whenever the body's cells use oxygen, they produce free radicals, molecules that have the potential to cause damage. Antioxidants work to prevent or repair this oxidative damage. Including foods in your diet that contain these natural chemicals works against the effects produced by free radicals, which are formed during metabolism. The damage that free radicals do to the body contributes to diabetes, cancer and heart disease. Research suggests that substances in cranberry juice may kill harmful bacteria that cause stomach ulcers, as well as help to prevent or lessen the frequency of urinary tract infections, according to Mayo Clinic. However, there is no current research showing that cranberry juice is as effective at treating active urinary tract infections. Proanthocyanidine -– a compound in cranberries -– may prevent H. pylori infection -– bacteria commonly found in the stomach that can also cause dental plaque. Drinking cranberry juice every day may help increase levels of HDL, or good cholesterol, and lower levels of bad cholesterol in the blood. Research is ongoing on other healthful benefits of cranberry including its effects on viral and yeast infections, heart disease and certain cancers. If you drink cranberry juice regularly in moderate amounts, select unsweetened brands or those with little added sugar. Because pure cranberry juice tastes quite bitter, many juices have sweeteners added. Cranberry juice high in sugar content reduces the number of healthful benefits. Diabetics should limit consumption of cranberry juice or drink juice that is artificially sweetened. Cranberry also contains high levels of oxalate -– chemical substances that contribute to the formation of kidney stones. In addition, cranberry can interfere with anticoagulant drugs – blood thinners that doctors prescribe to treat heart disease.